The Virginia Beer Company is excited to announce that we are seeking another full time (40+ hours/week) staff member to join our taproom team in a long-term capacity! Please read through the description below and follow the instructions at the bottom of this page to apply. A career in beers & cheers awaits! Pour beers, with attention to detail ensuring beer-clean glassware and proper head height. Restock and organize packaged beer in taproom reach-in - accurately rotate products. Service and fill crowlers/growlers/grunts for to-go purchase. Answer questions about beer styles, VBC products, and area events over the phone and at the bar. Clean/organize taproom, taproom amenities (eg, restrooms), and beer garden spaces. Maintain bar area before, during, and after taproom hours. Restock, organize, and change kegs in the taproom cooler - clean draft lines as required. Organize, keep tidy, inventory, and sell merchandise. Assist with live events and special releases (on and off-site). Open and close the facility as a key-holder. Compose nightly closing emails to communicate to Taproom Manager about shift occurrences. Complete transactions in point of sale system and accurately handle cash and credit receipts. In addition to taproom hours, help with private events on Tuesday’s as needed. Execute weekly taproom specials and provide news about upcoming events. Demonstrate intimate knowledge and understanding of the Virginia Beer Co. story, beers, and culture. Participate in brewery events and knowledge-building exercises. Act as a positive brand ambassador for VBC - in person, online, and in the wild. Candidates should be committed to seeking a full time, long-term position; we are a close-knit group working together in a collaborative environment, so we take great pride in our team dynamic! Willingness to work both individually and in a team setting, and in a fast paced environment. Interest in learning about the brewing process and facets of operating a brewery + taproom + beer garden. A desire to be outgoing, conversational, and social (beer is fun!) but the ability to stay professional (brewing is work and ABC laws are no joke). Interest in being the face of a company; our taproom staff are the public facing persona of the brewery! A thirst for adventure...we are still a relatively young startup, so there are still many adventures yet to come! Backgrounds in the brewing industry and/or within the bar and restaurant worlds are helpful but not required. More important: passion for the community. Our company mantra is Beer · People · Purpose. We are dedicated to engaging the community around us and giving back to it. Whether it be the beers we brew, the events we host, or the interactions we have with each patron - our staff must be excited about the opportunity to build up and give back to the community in which we live, brew, and play. In addition, candidates should have flexibility in availability. Additional staff will especially be needed during peak hours such as Friday evenings, Saturday afternoons/evenings, and Sunday afternoons. If you foresee regular difficulty in being available during these times, please let us know before accepting a future offer. We pride ourselves on offering an engaging work environment, competitive full-time benefits, and opportunities to grow as we do. We look forward to working with you and working together to serve the Williamsburg area and beyond! Help us make more beer! We're starting the search to grow our production team. We have new tanks, more taps, growing territories, and a canning line on the way! If you're interested in a career involving everything that goes into beer & brewing, click on the link below to learn more about joining our badass brewing team. VBC is celebrating small, independent craft beer with a week of events in honour of American Craft Beer Week! Join us every day from open on Monday, May 14th through close on Sunday, May 20th for a week of taproom events, new beers, new food trucks, daily specials, and a surprise or three. 🍺 Rock ANY American craft brewery swag and receive 20% off VBC swag! 🍺 Event: Rock, Paper, Scissors, Beer! Plus: An entire month of #DeadboltDay events! Thank you for joining The Virginia Beer Co. for our 2-year anniversary celebration! We can't wait to host you for beers & cheers throughout Waypost Week, and we hope that Saturday's all day brewery block party will be the second of many annual celebrations of local flavors + local sounds. Gates open at 12 pm and Music begins at 2 pm. Event is rain or shine! Below you will find all of the information regarding entry to 3/24's Music Festival! If you've purchased your tickets online, you have purchased entry to Saturday's festival! In an effort to save our trees, there is no need to print anything out. We have a live record of everyone who has pre-paid for tickets. All you need for entry on Saturday is an ID matching the name of the purchaser for each set of tickets. We will have an Advance Tickets Purchase check-in at the right of the gate when you arrive and we will be handing out wrist bands, glassware, maps, and beer tickets upon arrival. Event is rain or shine - the Beer Garden & Beer Garden Stage are already tented, and we will tent the Festival Stage in the brewery rear and a large portion of the parking lot if inclement weather is expected! We will be selling additional entry tickets at the door! If you have friends/family who do not have tickets, they may purchase entry upon arrival. $12: Standard (21+) ticket for entry, wristband, glass, and beer ticket. $5: DD / Under 21 ticket for entry. Please Note: For everyone who is receiving a Standard (21+) ticket that includes glassware and a beer ticket, we will need to see an ID for each ticket to verify everyone receiving a glass is at least 21 years of age. Please make sure everyone who plans to retrieve tickets purchased under their name brings a valid photo ID with the same name, and that everyone in your group who will be receiving a 21+ ticket brings their own valid photo ID to verify an age of 21+. On 3/24 the entire brewery property (parking lot included) will be roped off for maximum beers & cheers! We have a number of nearby spillover parking options arranged for convenient access to the property. 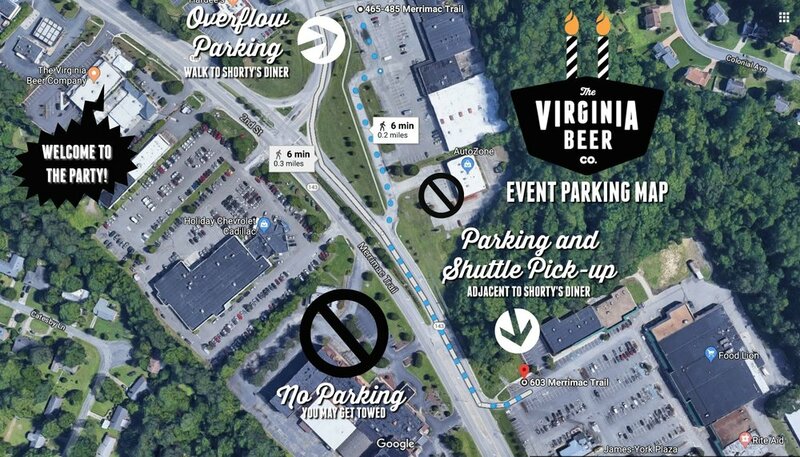 A shuttle (courtesy of Taste Virginia Tours) will be running from a pick-up point (denoted by signs and striped fire lanes) at the corner of the James-York Plaza off of Merrimac Trail / Rte. 143 at 603 Merrimac Trail from just before Noon until 9:30 pm. Just look for the Taste Virginia Tours bus at the pick-up location and hop on when it returns from dropping fellow Waypost guests at the brewery every few minutes! All Day: Satellite parking is available at the James-York Plaza (603 Merrimac Trail) in the spaces adjacent to (but not in front of) Shorty's Diner and throughout the Plaza. All Day Spillover Parking: Additional satellite parking is available in the adjacent shopping center by Sherwin-Williams (457 Merrimac Trail), Family Dollar (461 Merrimac Trail), and Aaron's (471 Merrimac Trail). There is a sidewalk that can be followed via short walk from the Spillover Lot to the shuttle pick-up location at 603 Merrimac Trail (walking directions). Just follow the signs along the sidewalk to the pick-up area! Starting at 2 pm: When Shorty's Diner (627 Merrimac Trail) closes for the day, they have agreed to let us use their lot and surrounding spaces for additional parking. See the below image for a bird's eye view of our spillover parking lots and shuttle pick-up location. Please Note: Our neighbors are aware of our festivities but if you park in the lot of a neighboring business that is open for business or you block an entry at a business lot (such as the wooden gate next door at Ebby's) you may be towed! DO NOT park in the Auto Zone (601 Merrimac Trail) lot or the George Washington Inn & Conference Center (500 Merrimac Trail). The owners of these businesses will tow non-customers/guests! As there are no crosswalks near our facility, we highly recommend NOT WALKING if you are parking at the above locations. 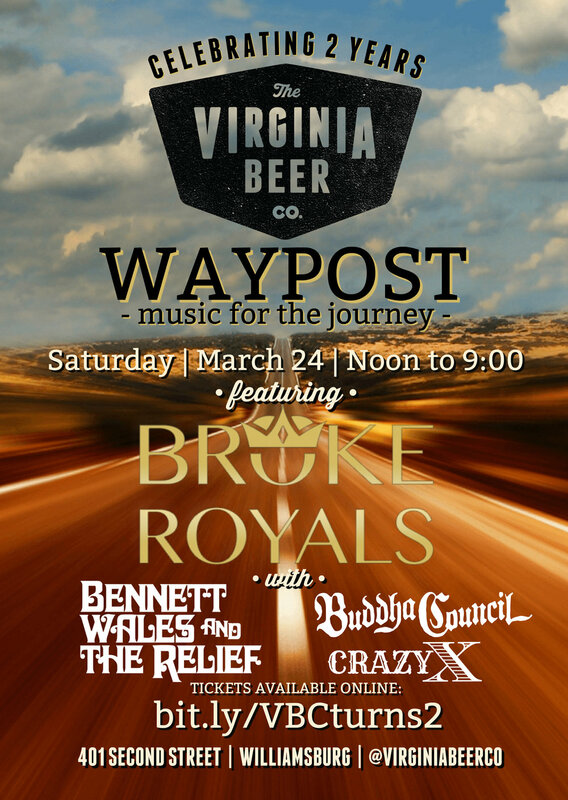 The shuttle service will be running the entire event every 5 minutes or less, so we ask that you let Taste Virginia Tours get you safely to/from the anniversary party! If you choose to ignore this recommendation and decide on your own to cross the street, please be EXTREMELY CAREFUL when crossing the road. Again, we strongly discourage walking if you park across the street. If you do decide to do so, this path and this path at stoplights provide your easiest method for crossing the street. Fingers crossed for a beautiful day on Saturday, and we are an easy walk from Colonial Williamsburg (directions here)! The easiest drop-off point is the Speedway (395 Second Street) located next to the brewery. Uber & Lyft are now options in Williamsburg! If you are a first time rider, use the promo code at this link (for Uber) and this link (for Lyft) to get discounts on your rides! WATA has two bus stops on the Orange Line near the shuttle pick-up and runs from 6 am - 9 pm on Saturday. Outbound Stop #10 stops right across from the Spillover Lot near Sherwin-Williams. Follow the signs along the sidewalk to the shuttle pick-up at James-York Plaza! Inbound Stop #14 stops in James-York Plaza. Simply walk to the corner of James-York Plaza off of Merrimac Trail / Rte. 143 and look for the Taste Virginia Tours bus (pick-up location denoted by signage and striped fire lanes). Every Standard (21+) ticket comes with a commemorative glass and one beer ticket. Beer tickets may be exchanged for one pour (8 oz. for high alcohol beers or 13 oz. for low alcohol beers). 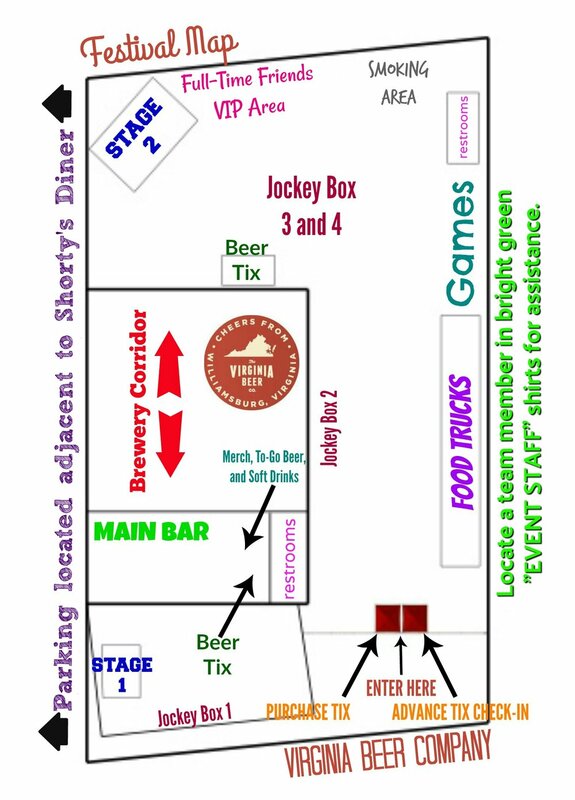 Additional beer tickets ($5/ticket) may be purchased after entry at stations located throughout the brewery property (see attached map, which will also be provided upon entry). We will have rinse stations around the property so please hold on to your glass! In order to make sure that only those who are 21+ are able to purchase beers, we can only provide one glass per 21+ ticket. If a glass is broken, we can provide a replacement glass for $5. Please note that 21+ ticket holders will have wristbands designating their age. If anyone who is not wearing a 21+ wristband is found with a beer we will have to ask them to leave, per VA ABC law. Once you have checked in at the gate, you will be given a wristband designating your ticket purchase (ie, Standard, Under 21, Designated Driver). Please do not remove your wristband! Staff will be monitoring the crowd to ensure that only those who with 21+ wristbands are sampling beers. Again, 21+ ticket holders will be given wristbands designating their age. If anyone who is not wearing a 21+ wristband is found with a beer we will have to ask them to leave, per VA ABC law. Equally important: wristbands guarantee re-entry! If you need to leave for any reason (such as taking to-go beer to your car), showing your wristband at the gate will permit re-entry from open until close. We will be placing tables and chairs throughout the property. If you would like to bring folding chairs, please feel free to do so! We ask that you limit these items just to chairs - no tables or oversized umbrellas will be permitted that may obstruct the view of other guests or access to the various stations set up around the property. We kindly ask that you do not bring any outside food or drink with you on Saturday. We will have FOUR food trucks serving from open to close (12-9 pm), and we'll have a bevy of beer and non-alcoholic beverage options available for purchase! No coolers will be permitted into the festival. If you plan to purchase bottles or cans, please do so when departing or feel free to take to-go package back to your car. Your wristband guarantees you re-entry! Per VA ABC law we are not permitted to allow additional alcoholic beverages on the property, so with the large crowd expected we are not able to permit coolers as a precautionary measure. This year we will be allowing pets to partake in Waypost festivities! If you decide to bring a furry friend, please plan to keep them leashed the entire time. Due to the increased crowd capacity, we ask that you please plan to keep pets outdoors as the taproom may get crowded as the primary location for ordering beer. We have a designated smoking area set up at the rear of the property (see attached map) and kindly ask that any smoking/vaping of any kind take place only in that area. No container (eg, Growler, Crowler) fills will be offered on Saturday due to the high volume of people expected. Please plan your fills for Friday (discounted fills from 12-3 pm) & Sunday (specials on 3-packs of Crowlers from 12-7 pm)! We will have a station set up in the brewery for to-go purchases of packaged beer & merch. Unfortunately we can't store purchases throughout the day, so please plan to purchase your beer as you plan your departure, or feel free to leave with your to-go purchases and re-enter with your wristband. We are not able to allow access to the property with to-go beers as any beer purchased to-go must be consumed off-site, per VA ABC law. Any beers purchased to-go must leave the property upon purchase. We look forward to a fun and safe celebration of all the things we love here at 401 Second Street with all the people who've supported us through this milestone. Thank you again for your support and we look forward to raising a glass with you on Saturday, 3/24! For information about beer tappings + musical lineups, please reference the lineup card you will receive upon entry to the festival and check the live event on our Facebook page! Questions? Don't hesitate to email us at taproom@virginiabeerco.com or call us at 757.378.2903. Note: As of 9/6/16, all positions have been filled! Thank you to all who have applied and we will be sure to post an update when more positions open up in the future. Candidates should have flexibility in availability. Willingness to work both individually and in a team setting and in a fast paced environment. Interest in learning about the brewing process and facets of operating a brewery + taproom + beer garden. A desire to be social (beer is fun!) but professional (brewing is work). Willingness to be the face of the company; our taproom staff are the public facing persona of the brewery! A thirst for adventure...we are a startup, so it will be an adventure! Backgrounds in the brewing industry and/or within the bar and restaurant world are helpful but not required. More important: passion for the community. We are dedicated to engaging the community around us and giving back to it. Whether it be the beers we brew, the events we host, or the interactions we have with each patron, our staff must be excited about the opportunity to build up and give back to the community that supports us. We here at The Virginia Beer Company have been working around the clock ahead of our grand opening, which is quickly coming up on Saturday, March 26th from 11 am - 9:30 pm! Beers have been brewed, the taproom is coming together, and the weather is turning towards beer garden season. So is anyone interested in getting together for a pint? We hope so because we have a lot of beers and a lot of cheers to share starting on Saturday! We're looking forward to welcoming you to our brewery + taproom + beer garden at 401 Second Street in Williamsburg, VA. We expect the grand opening to be a lot of fun and want to ensure everyone has a great experience. Ahead of Saturday's festivities we're putting together some notes to make sure the day is organized and the service is efficient - meaning everyone joining us for the celebration can spend more time enjoying beers & cheers with us. Coming? Let us know on Facebook! Tickets: In order to make the beer ordering/serving process as simple as possible, we will be selling beer tickets at the door. This makes any line that may form start at the door and not at the taproom bar! We have three serving sizes: 4 oz. - 10 oz. - 16 oz. One ticket = 4 oz. Two tickets = 10 oz. Three tickets = 16 oz. Each ticket will cost $2.25 (tax included) and you may purchase up to 12 tickets ($27 total, tax included) on your way in. Once inside, you can exchange up to three tickets at one time. If you use all of your tickets but decide you're enjoying the day so much that you'd like another round, you will be able to purchase additional tickets. BEERS: We will have eight beers on tap at 11 am, and have additional batches in kegs at the ready should we thoroughly enjoy all of one of our small batch Workshop Series beers before the day's end. We will also feature a jockey box on the beer garden featuring two beers! At some point in the day we'll be tapping one keg of a special Double IPA (DEADBOLT), and we will also feature two different cask beers throughout the day. Please note: we will be featuring draft only selections when we open, and plan to begin offering canned beer later this summer! Flights/Growlers: To ensure that everyone has a chance to try our beers, we will not be featuring full flights or grunt/growler fills on Saturday. You may exchange up to three tickets at one time, so you could choose to sample three 4 oz. pours. We encourage sampling small sizes of many of the beers as some of our Workshop Series batches may not return to rotation anytime soon! Never fear: we will host limited hours on Sunday, 3/27 from 2-7 pm and will offer full flights and grunt/growler fills starting on Sunday and beyond! Cash/Credit: If possible please bring cash with you. We will accept all major credit cards, but cash exchanges will greatly speed up the ticket purchasing process! And once inside, please remember to tip those who will be carefully pouring your beers. Even though the monetary exchange will take place away from the bar, the hardest work of the day will be taking place behind it! Also of note: apologies in advance but at this time we do not accept checks. FOOD: We are thrilled to announce that our friends KARNAGE ASADA will be inhabiting our food truck pull-in alongside our beer garden from 12-8 pm on Saturday. Meals purchased from Karnage Asada may be enjoyed both on the beer garden and in the taproom. In addition we will offer local varieties of Whitley's Peanuts and Route 11 Potato Chips for sale in the taproom. Please come with an appetite for fun & food! Parking/Transport: We have 46 spots around our facility, all of which you make take advantage. We are hoping for a capacity crowd on Saturday so if possible, please consider carpooling! If you are a local, the use of alternative methods of arrival would also be appreciated. There are sidewalks leading in all directions to/from the brewery, and while our bike racks are not yet installed (but will be coming soon!) we have numerous posts around the facility to use for chaining up your bicycle in the meantime. The WATA bus route runs near the brewery and we would also suggest ride share options such as local cab companies, Lyft, and Uber. If you do end up driving and need to park elsewhere, please be respectful of our neighbors. While they are open to helping us with spillover needs we would like to keep their lots clear when possible! Guests of all Ages and Varieties: 401 is a family friendly environment and we ask that no one under the age of 21 comes to the brewery without being accompanied by a parent or guardian. While we also plan to make our beer garden a pet friendly space, we would also ask that the pups and kittens of the area refrain from attending Saturday's celebration. With the spring weather looking sunny and clear we expect the garden to be rocking & rolling and would hate for anyone's paws to get stepped on. Smoking/Vaping: 401's taproom and beer garden are both smoke free environments. Due to the roll-up garage door that will remain open to the front of the building on nice days, we can't allow smoking on the garden. We will have a designated smoking area along the rear sidewalk along the building and ask anyone who steps out to please follow the posted signs to this space. Thanks in advance for your consideration of others! Saturday is going to be a great day and we can't wait to celebrate our opening with each and every one of you. Please be patient but don't hesitate to let us know if you have any questions or concerns throughout the day. Come prepared for a crowd - let's all make some new friends! Looking forward to inviting you in to know us and our beers better. Cheers from Williamsburg, Virginia! We love being part of a community that is always finding new ways to celebrate great beer. The Colonial Williamsburg Foundation is even getting in on the fun! The Foundation will be hosting a symposium entitled Ales Through The Ages from March 18-20. The three-day event is chock full of incredible speakers, including author Randy Mosher, Karen Fortmann of White Labs, author Stan Hieronymus, Andrea Stanley of Valley Malt, John Mallett of Bell's, Mitch Steele of Stone, and beer historian Ron Pattinson, just to name a few. Multiple tasting opportunities are also included in the schedule. More information about the conference, including registration information, can be found here. Frank Clark, Master of Historic Foodways at Colonial Williamsburg, has done a fantastic job bringing such a high-profile symposium to Williamsburg. March is a beautiful month here in Williamsburg. We are looking forward to hosting craft beer lovers in town for the symposium in our taproom and beer garden! It's been an amazing start to the new year in the Greater Williamsburg area. The biggest news (at least for us) is that The Virginia Beer Company's buildout at 401 Second Street is practically complete! With the exception of a few odds & ends on our punch list, we've been working steadily along to make this facility into the brewery of the future. With the wrap of construction and the start of brewing (maybe that's bigger news! ), we've been busy getting ready for a grand opening in the spring, and find ourselves trying to take a moment to recap the amazing start to the year. In our last update, we provided a few notes on the delivery of our brewing equipment and the progress of our buildout. In addition, we were getting hungry over the prospect of food trucks being allowed in York County. The December vote that was set to allow food trucks was tabled due to a complication (per WYDaily), but the New Year's resolution stuck early and the Board of Supervisors passed the updated regulations in January (per WYDaily) (almost a year after we first started the conversation)! We had initially worked to design 401's beer garden so that food trucks could pull alongside the space and provide access to their sumptuous morsels while our patrons were enjoying the outdoors with a Virginia beer in hand in front of the brewery. We're now excited about the opportunity to work with Williamsburg's amazing culinary artists and introduce the area to some new flavors (such as from our friends at Karnage Asada) now that we can formally host food trucks at 401! Meanwhile, the Hampton Roads craft beer scene continued to grow in new and exciting ways. Future openings by fellow newcomers were announced and upcoming moves and expansions by other known brewers were unveiled. In addition, the year-end brought with it a time of celebration for the amazing brewing going on around the area. We were thrilled that our Public Frenemy No. 1 collaboration with fellow York County brewery Alewerks Brewing Company received a silver medal for Best Collaboration at the VEER Magazine Golden Tap Awards! To play even a small role in the HRVA craft beer scene in 2015 before we open was a great thrill. We CANNOT WAIT to get even more involved when Spring 2016 rolls around! It has been a whirlwind around 401 Second Street the past few months. We have been working steadily through our buildout and site work, and after many months are mere weeks away from the completion of these tasks. All of our major brewing equipment is now in house, and if all goes well Virginia Beer Co. will be brewing in a few (comparatively) short weeks! We had a quick mention in a recent business notes section in The Virginia Gazette to mark the milestone of our equipment delivery. We've also been working closely with York County on their food truck regulations. After many conversations about the viability of food trucks in the area, and our desire to host them at 401, we are happy to report that York County's Planning Commission came out in support of food trucks in November! We're now less than a week away from a final vote on the topic by the York County Board of Supervisors on 12/15. If all goes well, we'll be seeing some tasty trucks roll in to Williamsburg (with many frequent stops at 401) in 2016! Exciting times around Williamsburg and around 401! The Virginia Beer Co. recently had the pleasure of hosting Elizabeth Erschens, of VEER Magazine & Virginia Craft Beer Magazine (and HomebrewUSA & HomeBrew USA -Hampton! ), at 401! Elizabeth turned that visit into a wonderful article that is currently gracing the pages of the most recent issue of VEER! We can't say enough how much we greatly appreciate the kind words. And we can't wait to host Elizabeth and everyone else at 401 once our buildout is finished; things will look just a little different and we'll have a lot more beer!